where: Weather, debt, Time since Christmas, time since failing our new year’s resolutions (Q), low Motivational levels and the feeling of a Need to take action (D is undefined) scientists have predicted that the most depressing day of 2013 will be Monday 21st January . So with five days to go until we apparently become depressed about life, the economy, the weather and complain about all and sundry – becoming a veritable Victor Meldrew – how prepared are you to face the year that is still at large? There are many things that alter our moods that we have no control over but the one thing that we can rescue and take charge of is the food we eat. What you eat and when you eat has a big impact on how we feel. Choosing foods that have a lower glycemic index will help fill you up and sustain your energy levels for longer as they help your blood sugars stay stable. I have previously mentioned the health benefits of porridge in “Oat to a Good Start”. Other food items that have a low glycemic index are pulses and lentils. 1st: Chop a medium onion and slowly fry in a saucepan. 2nd: Add your Puy Lentils and slick in the oily onion mixture. 3rd: Add 3 times the amount of water to lentils and add a stock cube. Bring to the boil and then simmer for 25mins. 4th: Once the lentils have cooked for approx 20mins, put the salmon fillet onto a very hot skillet. Cook on its presentation side for approx 5mins and then flip it onto its skin side for a further 4mins. If you are cooking any greens to go with make sure these are ready to go once the salmon is cooked. Not only are the lentils great here but the salmon high in Omega-3 and the asparagus rich in antioxidants and nutrients makes this a power-meal. 1st: Prepare the lentils as in the recipe above. 2nd: Cook your sausages on a low heat for around 15mins turning throughout they cooking until the colour all around. 3rd: Once the sausages are ready remove them from the pan and add a splosh of red wine / port to deglaze the pan. Crush some garlic into this and stir. Scrape the sticky bits at the bottom of the pan with a wooden spoon and reduce until the ‘red gravy’ is slightly thicker. 4th: Plate up! 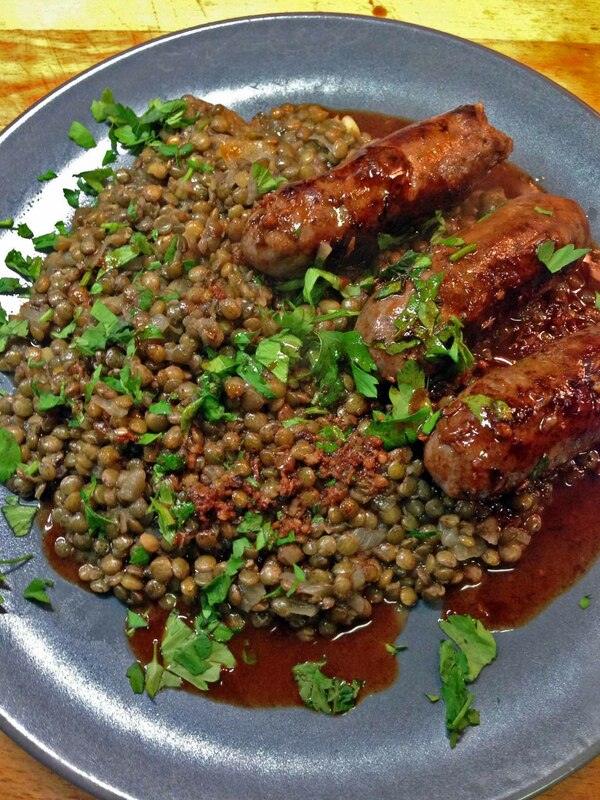 Pour the juices over the sausages and lentils. Sprinkle with some fresh parsely. Lentils love pork – my Gran used to make lentils with chopped chorizo pork sausage and I normally pick a herby variety however, the ones in the photo above are a venison and merlot variety. So with a plate of lentils on my lap to warm me this winter’s night I wish you health and happiness for the year to come. Don’t leave it to fate – break the Blue Monday curse. In the past, no matter what time we went to bed at and no matter how much toasting to the new year had gone on, someone (Gran and Mum) had to wake up early and get started on preparing and cooking a New Year’s lunch for a family of 7+. On most occasions, the same food as that on Christmas Day was painstakingly prepared and elaborately presented throughout a lavish meal where no one – not even the dog – could could eat any more. Buttons ready to pop and the brussel sprouts working their magic, everyone then descended onto the sofa to sleep off the meal as well as the previous night’s excesses. Then in the evening, even though still full to bursting, a cheese board or sandwich were necessary to stave off the hunger pangs that would then attack during the night. Or the best one: “I could really do with something sweet,” as you slice into the banoffee pie for the third time! However, this year we came up with an alternative idea. Primarily to try to eat with some modicum of sense but also to accommodate a very necessary lie-in. We decided upon starting the day with a New Years Brunch and then having a Roast Dinner for supper. Whereas everyone else had juices to wash their breakfast down with I hit the jackpot with my choice of breakfast beverage, CHAMPAGNE! So as not to encourage the idea that I may appear to be an absolute dipsomaniac please let me explain: On New Year’s Eve I had put a bottle of champagne (not cava) into the freezer to chill whilst I got on preparing the food for the evening party and forgot about it. 5 hours later when I went to pour out some glasses of bubbly to toast the New Year with the champers was solid! Thankfully M&S had given us a complimentary bottle for spending so much on food that my actions were not totally disastrous. Roast beef with horseradish gravy, roast potatoes, green veg and Yorkshire Pudding. This was a much more appreciative way of preparing food. The brunch consisting of smoked salmon and cream cheese bagels, ricotta hotcakes with summer fruits and champagne was on the right side of decadence to herald in the new year. The fry-up very necessary at filling us all up until dinner time. New Year’s dinner was delicate and flavoursome, gutsy and well-balanced. The beef was prepared with a horseradish gravy and cooked rare, potatoes par boiled and then roasted in goose fat served with steamed vegetables. Below you can find the recipe for my simple Scallops and King Prawn San Jacques. Bring 300mls of milk to the boil with bay leaves, a couple of rasps of fresh nutmeg, peppercorns and salt. You can also add a couple of cooking cloves but I tend to leave them out. Remove it from the heat and leave to infuse for 15mins. To make it easier to work with I then strain the milk into a measuring jug for easy pouring. Melt a wodge of butter in a saucepan and add 2 tablespoons of flour. Cook gently, stirring, for 1 minute. This is now called a roux. On a low heat, add the milk infusion a bit at a time whisking it into the roux before pouring in the next bit. Continue like this until all the milk is absorbed. If you want to make this a cheese sauce add your cheese at this stage. Stir it gently until all the cheese has melted. Take care as this has the tendency to catch on the bottom of the pan if your hob is too fierce or you discontinue stirring. 2nd: In a shallow saucepan, fry the king prawns until pink. 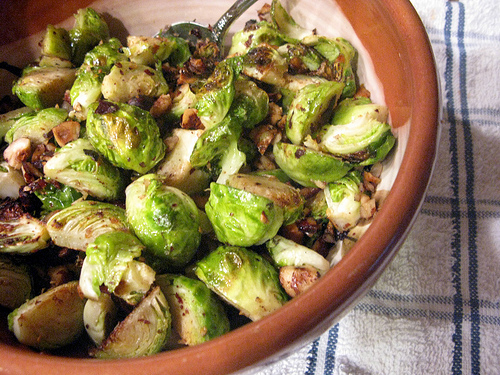 Decant them into an oven dish. 3rd: In the same saucepan, quick fry the scallops for around 30secs a side. Add these to the prawns in the oven dish. 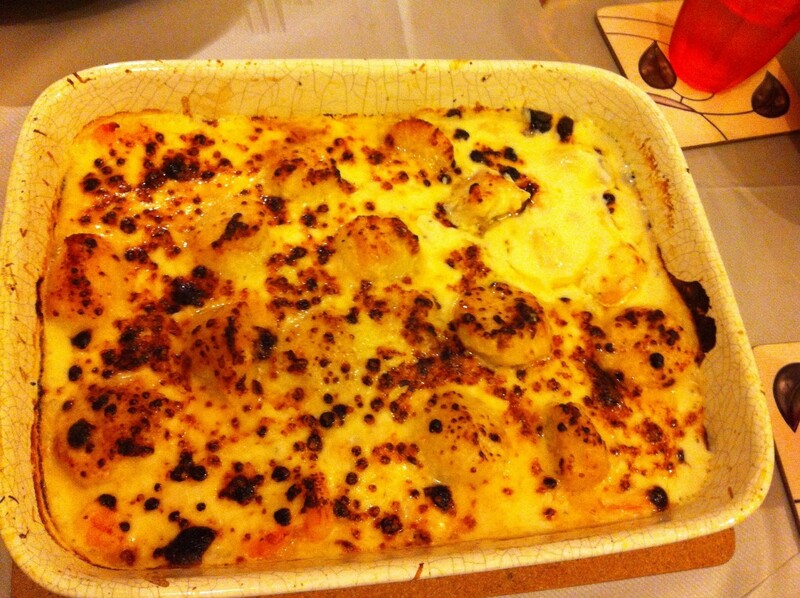 Cover over with the bechamel sauce and sprinkle with parmesan cheese &/or breadcrumbs. Place under the grill until it begins to colour. If preparing individual portions, try to use the actual scallop shells instead of an oven dish to serve the scallops and prawns.